Signature Iron Doors is proud to show you our most recent Iron door installation in Portola Valley, CA. This stunning iron entry door was the perfect fit for this unique home and leaves a lasting first impression. 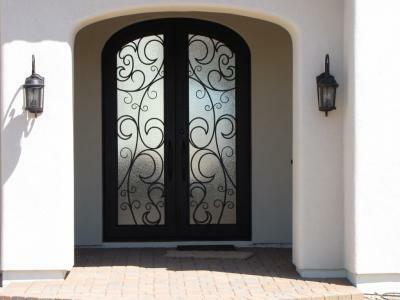 This iron door has hand forged scroll work and a textured operable glass panel for privacy. The door arch mirrors the unique shape of the entry way and the finish matches the correlating light fixtures. Overall this door transformed the face of this home and our customer was extremely satisfied. Living in Portola Valley means that you probably paid a hefty price to live in this beautiful coastal countryside and you should be proud to give it your own touch of style. The team here at Signature Iron Doors invites you to take a look at our website and contacts us to see how we can turn your "house" into your "home".